- Smart App Syncs with Fitness Apps - Over Millions happy global users, RENPHO App syncs with APPLE HEALTH, GOOGLE FIT, and FITBIT APP. - 11 Essential Measurements - Scale shows body weight, data including Weight, BMI, Body Fat Percentage stores to app. You can weigh yourself anytime WITHOUT your phone. The data will sync to the app once it is connected again! - Free Friendly App - Download RENPHO app for FREE in Apple App/Google Play. 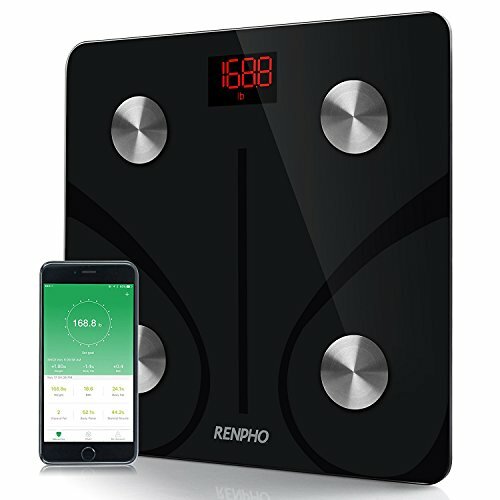 RENPHO App works with Bluetooth 4.0, supports Android 4.3 & IOS 7.0 or above system(due to Bluetooth chip compatibility issue, Google Pixel 2 & Pixel 2 XL with Android 8.1 are unable to connect to RENPHO app temporarily). - High Quality Product - Auto calibration, high precision sensors measure in increments of 0.2 lb./0.05 kg with 396lbs/180kg capacity. 4 sensitive electrodes, 6mm tempered glass platform, 3 x AAA batteries included. FDA/CE/FCC/ROHS Certificated. - Local Customer Service - 100% Satisfaction Guarantee & Local Customer Service based office.